Samwil was born on 24 December 2004. In his family’s village, Lamlumpu, most babies are born at home. If there hadn’t been complications in the pregnancy, he would have been too. Instead he was born in a hospital in Banda Aceh, capital of the Indonesian province of Aceh. Being there saved his life and that of his parents. A powerful earthquake in the Indian Ocean early on the morning of 26 December sent a massive tsunami that swept away thousands of villages in India, Indonesia, Sri Lanka and Thailand. Aceh was first and worst hit by the wave. In Samvil’s village, three out of four people were killed. They found his grandfather in a pond, only recognisable because he had identification in his pocket. Caked in mud, those bodies they couldn’t identify were buried in a mass grave. Matakin was at home in Lamlumpu when the 10-metre wave struck. “I didn’t know where to run,” he said. He doesn’t remember anything about being caught in the black water. When he regained consciousness, he was hanging from a coconut tree. Badly injured, he nevertheless survived. Twelve of his relatives died. “I lost everything. The wave ripped off my clothes. All I had left in the world was a ring on my finger and the shorts I was wearing,” he said. The destruction was unimaginable – the human suffering even worse. “You were either dead, drowned or devastated,” said one Caritas colleague who visited soon after. 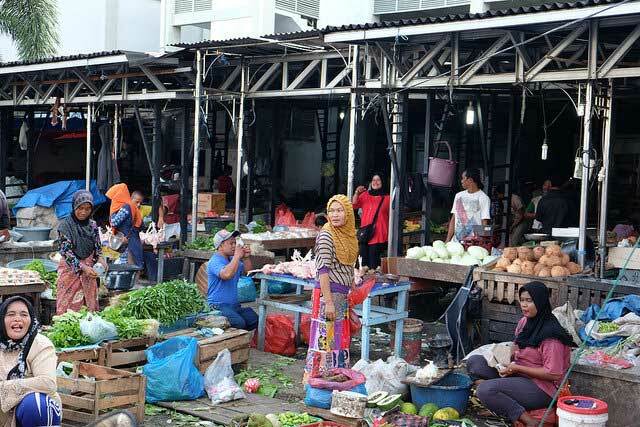 Half a million people were made homeless in Aceh alone. 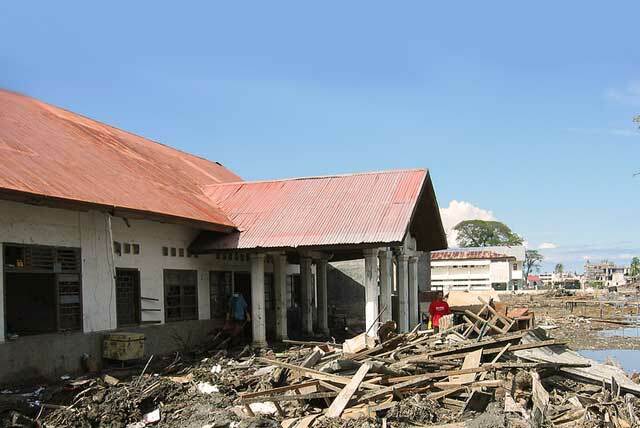 Catholic Relief Services was one of the Caritas organisations operational there after the tsunami, working with the support of the confederation. Samwil and Matakin both live in a CRS-constructed house today. “I’m happy to have this house,” said Matakin. Now 30 years old, he has married and has a child. 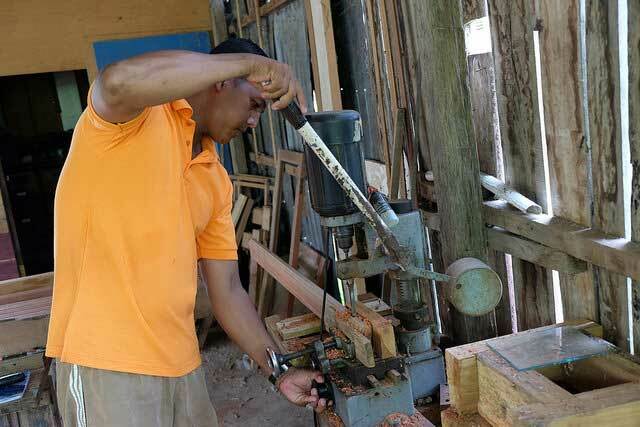 He has built a carpentry workshop next to his house. “The village has come back to life,” he said. In some cases, Caritas paid local people to help rebuild homes. By offering cash or food for doing this construction work, Caritas provided employment that restarted the local economy. It also made people more self-sufficient. If you helped build your own home, it became less of a handout and more of a hand up. Trying to kick start the economy, Caritas also supported the building of commercial centres and local markets. 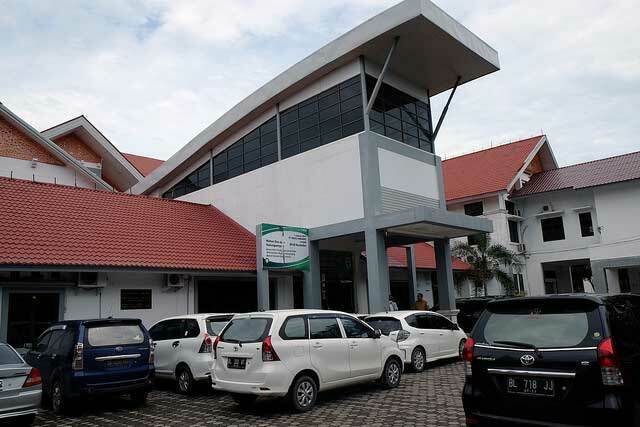 Caritas built over 9000 permanent shelters in Aceh, as well as 350 infrastructure projects such as schools, clinics, roads and markets. The YKA Kindergarten was one of them. Situated in downtown Banda Aceh, it was completely washed away by the tsunami. Its pupils and teaching staff were decimated – only 30 children out of 600 returned after the tsunami and 17 out of 60 teachers were killed. There was nothing left of the old school. “All you could see here was the sea,” said one teacher. Staff worked together to clear it out and then the whole school was completely rebuilt. It reopened in 2008. “The new school is such a better environment,” said Halimah, the headmistress. Now it has an ethos that promotes diversity and the preservation of the environment. The fees of the better-off children help pay for poorer children to attend. They are currently expanding next door to include classrooms for elementary children. In 2004, there was no medical centre devoted to mothers and children. Now child health is in line with the Millennium Development Goals. “Without the tsunami, the centre would never have been built and mother and child healthcare wouldn’t have improved. The aim to ‘build back better’ was achieved here,” said Hasrul Syah. More than 700,000 individuals received health and counselling thanks to Caritas supporters. Down the coast in the rural areas around Meulaboh, there were new clinics for midwives, as well as training and public education for new mothers. “There is a big difference,” said Ernawati, a midwife’s assistant. “It’s better now. There is space. It’s clean and there is equipment. The mothers use the clinic. If there is a problem, we can get them quickly to the medical centre for emergency treatment.” Before the tsunami, local health officials in her region say two to three mothers would have died in childbirth. It’s zero for 2014. The tsunami also served as an impetus for a peace agreement in 2005 between the Indonesian government and the Gerakan Aceh Merdeka (GAM), the Free Aceh secessionist movement. The pact ended decades of conflict that claimed an estimated 15,000 lives. Buyung Arta was one of the rebels. He was living in hiding in the jungle with his wife and daughters when the tsunami struck. He rushed back to help his rural village, near Meulaboh. “There was no life left,” he said. He had lost 23 of his family. “We [the Acehnese] had to work together as one family to rebuild. The international relief effort helped too because it brought about reconciliation. It gave us hope. The tsunami brought peace,” he said. His daughter, Nurlinda, is 21. Ten years ago, she was living in the jungle with him, without access to school. Since 2007, she has lived with the rest of her family in a house built with the support of the Caritas confederation. She is studying community health at a local university, with two years left to go. Not every aid programme was a success, but most were. Not every house is still lived in, but most are. Some became dependent on aid, most didn’t. The World Bank described it as the “most successful reconstruction effort”. Back in Lamlumpu, 10 year old Samwil and the other children in his class have no memory of the tsunami. But for those who lived through it, that day will never fade. On 26 December 2014, they will be gathering to commemorate lost loved ones, but also to pay tribute to the survivors. Collectively the people of Aceh, with solidarity from around the world, achieved something remarkable – from the mud and debris, they built a more peaceful, more equal place, full of opportunities.